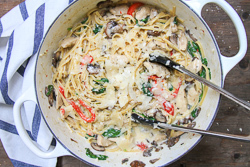 This recipe utilizes Secret Speedy Technique #3: The One Pot Pasta. 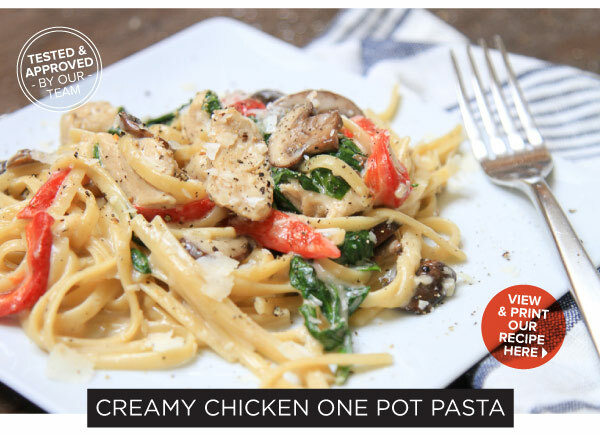 A "one pot pasta," as you might expect, delivers a delicious pasta dinner with only using one pot --smart! 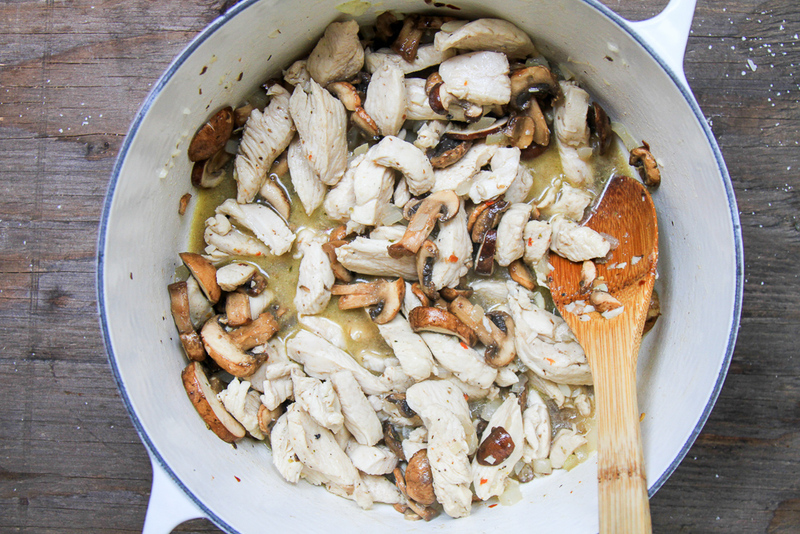 This recipe boils the pasta in chicken, giving the whole dish an extra depth of savoriness. 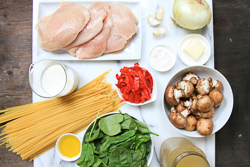 The bright pops of spinach and pepper nicely complement the earthy mushrooms and hearty chicken. 1. In a large Dutch oven pot, heat the butter and olive oil. 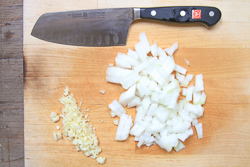 Sauté the onion and garlic until the onion starts to become translucent. Add the chicken, crushed red pepper, oregano, salt, and pepper. 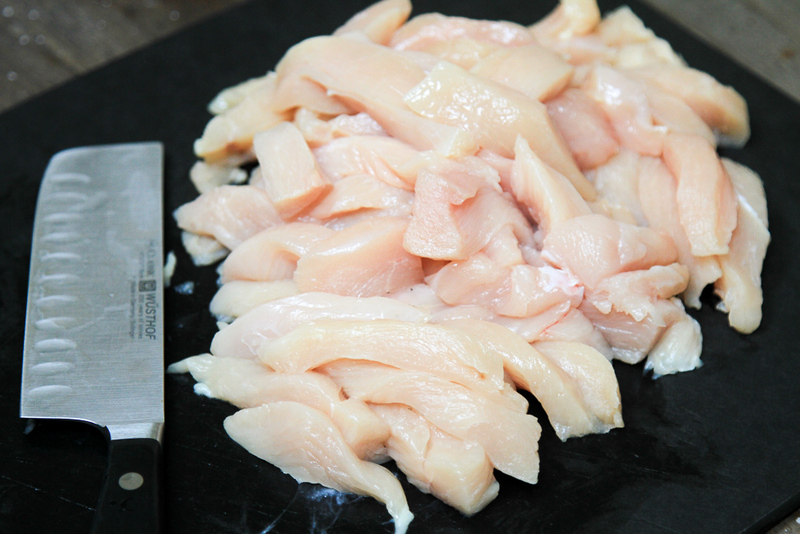 Brown the chicken pieces on all sides. 2. 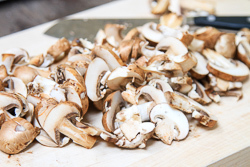 Make some space in the middle of the pot, and add the mushrooms and cook until they become tender. Sprinkle with the flour, and stir. 3. Add the chicken broth, and bring to a simmer. 4. Add the pasta, and simmer for about 9 minutes, stirring every few minutes to ensure that the pasta doesn't stick to the bottom of the pot. Cook until the pasta is al dente. 5. 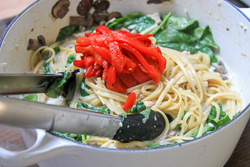 Turn heat to low and stir in the cream, fresh spinach, and roasted red pepper slices until all is combined and slightly thickened. Season to taste with Kosher salt and pepper. 6. 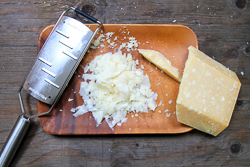 Serve with a generous garnish of shaved parmesan cheese. Question of the Month: How do I cook dried hominy?